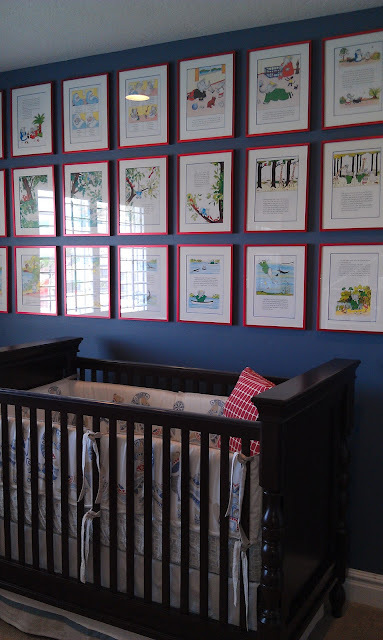 Anyhoo, today I thought it would be fun to share some photos of model homes that I have toured recently. They are all taken with my phone, so they're not the best quality, but each room has some great inspiration/ideas...so enjoy! The designer of the above room used two of my favorites... Ballard Designs and Serena and Lily. 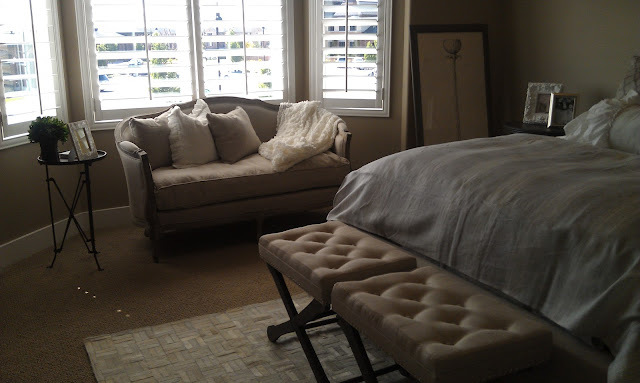 Notice the pretty settee and side table - both from Ballard's - and that amazing rug from Serena and Lily - I've been wanting that rug for-ev-ah. 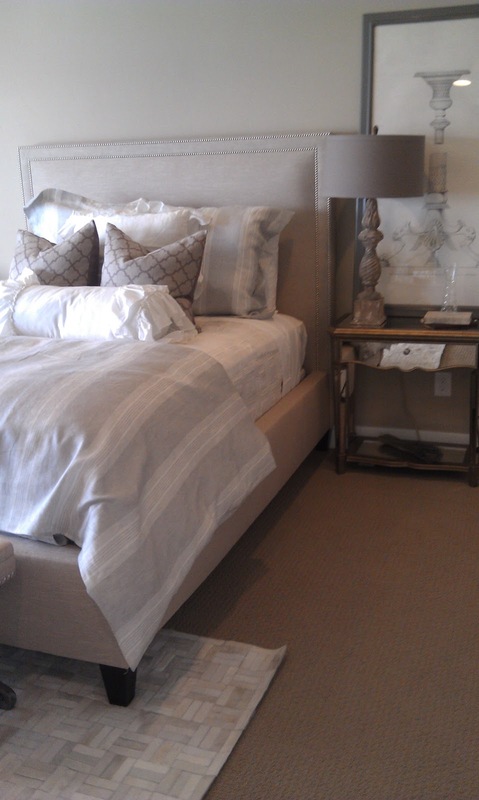 This room is a fabulous example of using neutrals. So much texture and movement. It was beautiful. 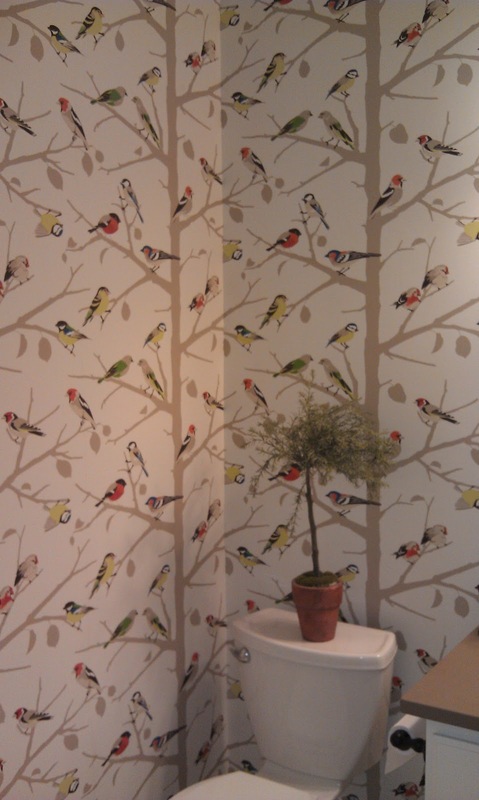 I absolutely loved this whimsical bird motif in the powder room. It's so cheerful! 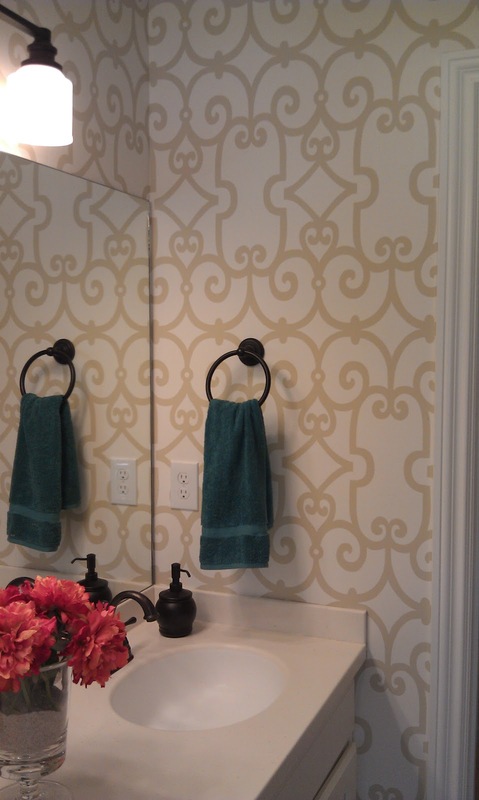 The subtle coloring, but bold motif, of this wallpaper made it one of my favorites. 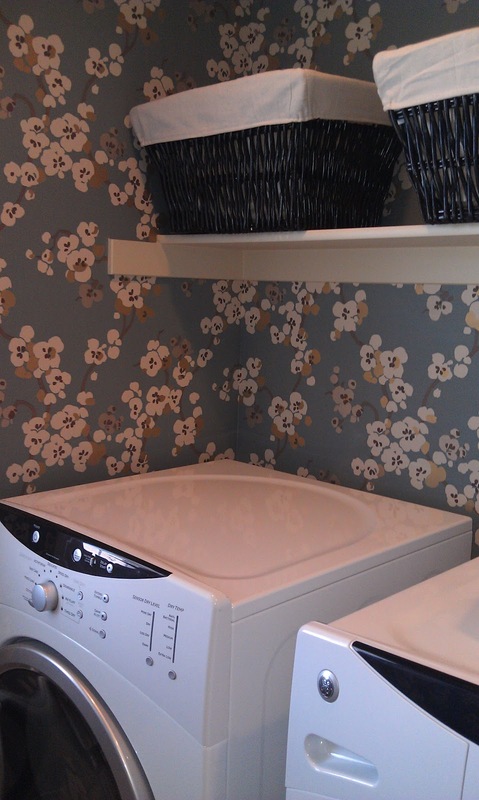 This pretty floral certainly cheered up the laundry room. I just loved this gallery wall in the nursery...every page of a story book. Very clever. I also loved the use of Schumacher's Imperial Trellis and Hothouse fabrics in this room. I tend to use more of a neutral palette in my own home, but I sure can appreciate great use of color like this! This tween bedroom was a lot of fun. 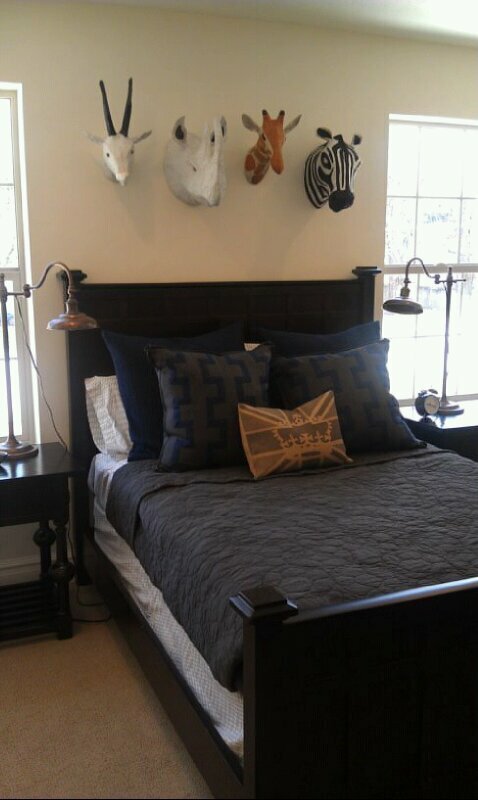 My favorite thing was the use of the four Anthropologie animal heads above the bed. They really made the space! 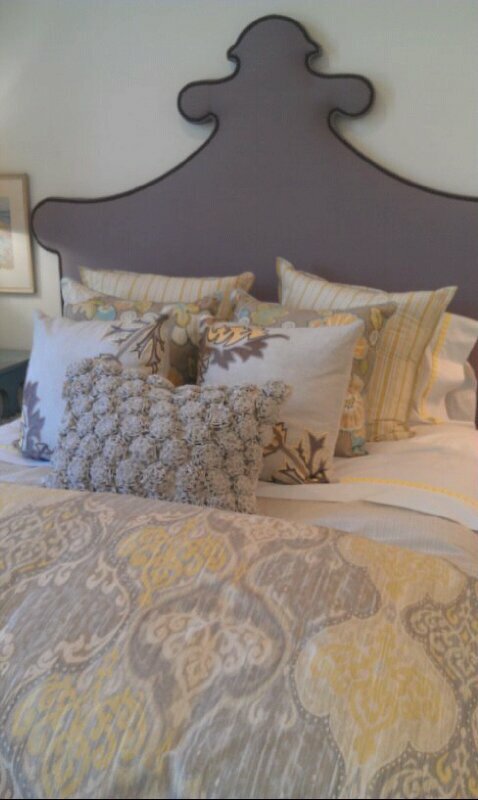 And I ADORED this bedroom. This is a little more typical of the way I use color in my own house. 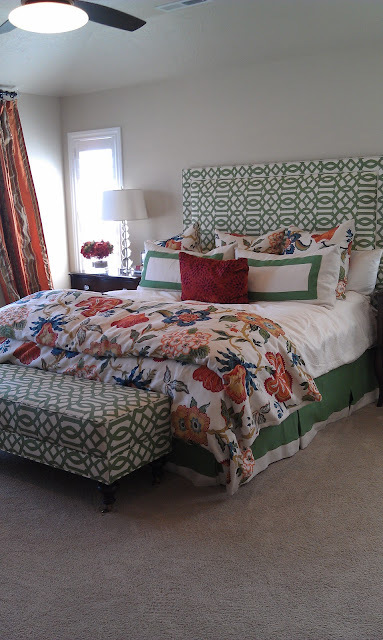 I'm a gray girl...and I fell head over heels for that headboard. Isn't it amazing? I hope you enjoyed this little bit of model home inspiration. I always love to see what other designers come up with for these spaces. And I never fail to leave with a bit of inspiration for my own designs. Love it! I am a model home junkie. I often visit the one at Daybreak- been through all of the last 3 'villages'. I remember riding my bike to the 'new subdivision' as a pre-teen to walk through the houses under construction. I just knew I would be an architect someday! I came close- landscape architect instead. I wouldn't be at all surprised to see "princess" follow exactly that path! I've always enjoyed touring models, and about 10 years ago, I got a job as a model home cleaner. It's been fun seeing all of the changes in design. I'm gradually putting my photos of them on my blog. It's a great source for ideas. these were a great inspiration! i have agree, at first was nt a big on the animal head but seeing that they were from anthroplogie i was convinced they werent real ;) i love the last bed, i too love the colour grey, i was wondering was headboard bought or made? I just want to crawl into the green and white bed with a good book! That looks like a perfect, snuggly spot! I love it!